Once I had all those pinwheels spinning in the center of my quilt, I had no choice but to surround those blocks with geese, to keep them spinning. My first inclination was to make the center geese units using medium toned pieces and the sky unit using dark toned pieces. Then I remembered my Toulouse quilt, and how the geese in that project were totally scrappy and how I loved that about that quilt, so that's what I did for Dulcinea. I figure it's OK to steal the border from one pattern to add to another, since both patterns are by Miss Rosie's Quilt Co. This is Lifetime Quilt Number 106 - Dulcinea. 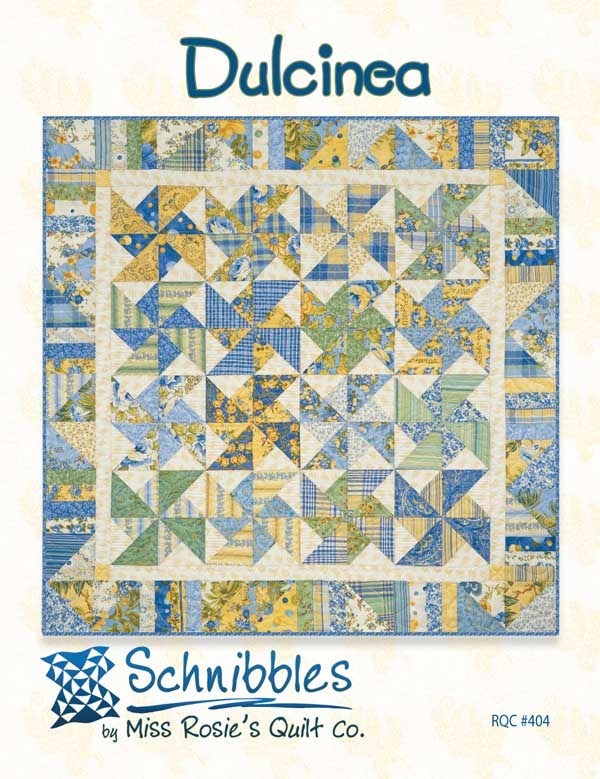 The pattern is Dulcinea by Carrie Nelson for Miss Rosie's Quilt Co. The fabric is American Banner Rose and Prairie Paisley II by Minick & Simpson for Moda. It finished at 49" x 49"
It has approximately 598 pieces. Thanks for all the great comments regarding those sticks on the pinwheel blocks. The secondary pattern was pure luck, but I liked how it turned out. The strips for the sticks were cut 3/4" wide, to finish at 1/4". My first attempt had them finishing at 1/2", but that was too wide. So the parade is Monday, and this is one speedy pattern, you still have plenty of time to piece yours. Thanks Sinta and Sherri for hosting this sew-along, I can hardly wait to see all the other Dulcinea quilts and what's up next! Very cool looking, Thelma. I love the flying geese border. If you have a chance please have a look at mine. Have a great day! Thelma, I love this..love your choice of fabrics..
Wow, you really whipped that up quickly. It's just love with the colors of fabrics you have chosen. Beautiful and I love the addition of the flying geese! You are amazing.. accurate and fast with a great color sense and eye for balance. Jacqueline said it all - you are amazing!!!!! Another great quilt. Thanks for sharing pictures as well as instructions for sticks! Wow and double WOW! Love the energy that the border added and LOVE the scrappiness of the whole thing! And just in time for July 4th! We have our guild quilt show this weekend and set up today, so a busy weekend. Have a great one, Thelma. Another super Thelma spin! Love it! Love your Dulcinea quilt, I think I'll need to make me a second Dulcinea (mine's already finished, too:-) inspired by yours! I'm posting about mine today, too. Your invention is so summery, so lovely. Did you keep the original name, or give it one of your own? Yours looks amazing. I love how you added the sticks. Thanks for the extra great ideas on every pattern you pursue! WOW!!! I love it! The flying geese look great! I need to make one for my grandson. I think if would lookd wonderful in a a child's room. Thanks so much for sharing the picture and giving us the stick measurement! I love the flying geese border.It suits the quilt. Love it. Adorable--and clever! I love the sticks--so fun. I love how you changed the original pattern to suit your own vision. I really love the "sticks" you added to the pinwheels and how they seem to spin because of your fabric choices. So clever. So gorgeous and very clever of you, Thelma!! So very cute! Love your last 2 finishes. Thanks for sharing. Adorable version of Dulcinea! Love it! The sticks was a good idea! This came out great! So unique. I love all kinds of Pinwheel blocks. The addition of the sticks is so clever, it gives the quilt so much movement! Love love love your clever version. The essence of summertime. Simply wonderful. Very cute! Love the sticks to keep the pinwheels free to turn. Outstanding Thelma :-) I love your twist on the pattern :-) It is so much fun!!!!! !